Alyssa Graves on the mound for the Bulldogs. Graves gave up earned four runs in her start against St. John’s. Jimmy Lafakis/Collegian file photo. The Butler University softball team’s season came to an end after the team was swept in a three-game weekend series at St. John’s University from May 5-6. The Bulldogs ended the year with a 20-28 overall record and 7-11 Big East mark. In the first game of the weekend, Butler got on the board first with two runs in the first inning thanks to a two-RBI double from senior outfielder Sarah Dixon. The Red Storm scored a single run in the third inning, but Butler responded with three runs in the fourth frame. Junior outfielder Jenna Foreman tripled to bring in two runs and senior infielder Alyssa Lach drove in Foreman with a sacrifice fly. From that point on, it was all St. John’s offensively. The Red Storm scored one run in the fifth inning and three in the seventh to force extra innings before scoring in the bottom of the ninth to come up with a 6-5 win. 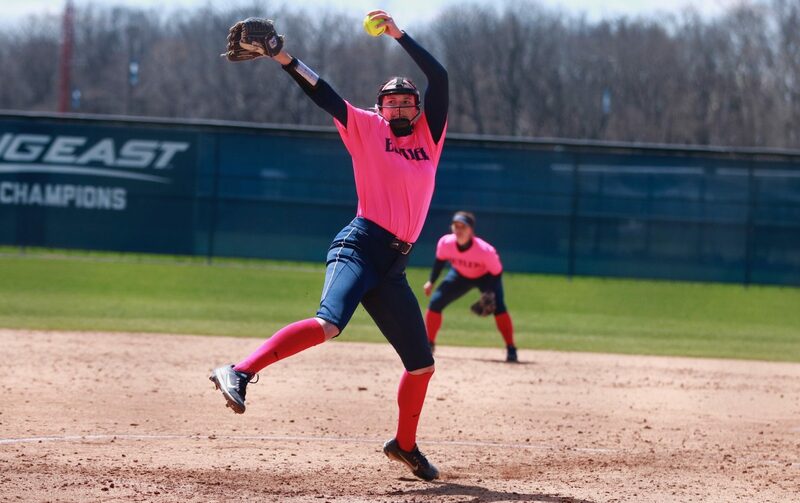 Freshman Alyssa Graves made the start for Butler, surrendering four earned runs on six hits, five walks, and seven strikeouts over 6 ⅓ innings. Junior Kaitlin Doud pitched 2 innings in relief, giving up one run on two hits. In the second game of the day, it was the Red Storm who struck first. St. John’s scored four runs in the first inning, four in the third, two in the fourth, and three in the fifth to take a commanding lead. The Bulldogs responded with a six-run fifth inning, a single run in the sixth inning, and a four-run seventh inning, but weren’t able to complete the come-from-behind victory, falling 13-11. Offensively, junior catcher Cheyenne Thompson led Butler with 4 RBI due to a fifth-inning grand slam. Lach and Doud each had three hits in the game. Sophomore Gabbi Schnaiter made the start for Butler, giving up all of St. John’s 13 runs over four innings before giving way to Doud, who pitched a scoreless final two frames. In the final game of the series, St. John’s scored two runs in the second inning and one run in the third inning to take another early lead. The two teams then swapped single runs in the fifth and sixth frames, with Butler’s run coming on an RBI triple from Foreman. Lach homered in the seventh inning in her final collegiate at-bat, but it wasn’t enough, as the Bulldogs fell 4-2 to end their season. Doud made the start and pitched all six innings for Butler, allowing two earned runs on 11 hits. With the end of the season, the Bulldogs will see the departures of seniors Lach, Dixon, Mikeila Boroff, and Ambry Turpen. The team is slated to return 16 letterwinners next season.